Car Floor Mats Made of Thick, European, Berber Carpet from Avery’s. Berber car floor mats in your vehicle. Ya, go ahead and be self indulgent. Your car or SUV will love you for it! 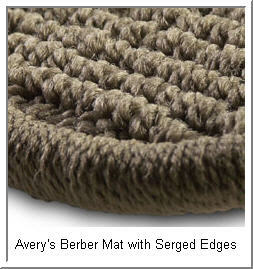 Avery’s line of car floor mats includes a European Style Berber that’s made of tightly woven 42 oz. nylon yarn with serged edges. A nibbed backing prevents the mats from slipping. Berber car mats are wear resistant and add a sense of richness and elegance to your vehicle while protecting your OEM carpeting from dirt and liquids. I really like the complementary color threads and the dark flecks that make these Berber mats look like something out of a Saudi Arabian sheiks' livingroom. And they are available in 1000’s of custom fit patterns, so there has to be a pair for your car! And just in case you're going to drive your car into a river or lake or big puddle these berber mats have a marine grade UV protective coating on them. That way your berbers don't fade whie you're drying out the car in the sun. Here's some additional information on the Avery Luxury Touring Berber Car Mat and Avery's other styles of car mats. 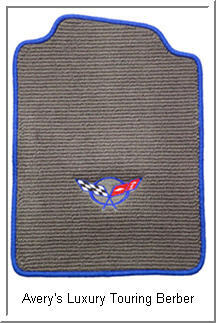 - protect the berber mats in your vehicle with a set of universal absorbent mats. The absorbent mat will prevent spills, mud and other gunk from penetrating into the berber fabric and causing smells and an unsightly look to your mats.